Listen to Denver Frederick, host of The Business of Giving interview Global Citizen Year Founder & CEO Abby Falik and others on the culture of Global Citizen Year. The interview is part of Better Than Most, a regular feature of The Business of Giving, examining the best places to work among social good businesses and nonprofit organizations. 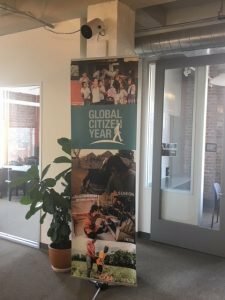 Denver: And for this evening’s Better Than Most segment, I went across the country into the offices of Global Citizen Year which is based in Oakland, California. We’ll begin with their Founder and CEO, Abby Falik, who will tell us about the mission of the organization and then you will hear from some of the members of the team. Abby: Global Citizen Year is on a mission to reinvent the “gap year” between high school and college as a launch pad for global citizens. Dennis: When I think about culture, for us, we’re a values-driven culture and for us, our values are wrapped up in what we think it takes to be a global citizen, a global leader. I would say our bread and butter is our GCB, global citizen behavior. That’s well-being and diversity and accountability and gratitude, curiosity, and that drives all of our work with our young people. For us, that also drives our work in terms of how we interact with one another, how we celebrate each other, how we address moments that are hard when we have tough conversations. Our values are central to us. Abby: When I was founding the organization, I remember being influenced by Netflix and their now famous Culture Deck. One of the things that struck me was their approach to vacation time which was not to limit the number of vacation days but to actually provide flexible time off, which essentially said, we trust you, our employees to get your work done and to take the time you need when and where and how you need it. We have taken that on at Global Citizen Year and similarly have a flexible time off policy we try to model from the top; that everybody is encouraged to actually take that time off to rest and replenish, so that they can bring their whole selves to work and be happy, well-energized, and productive. Erin: Every board meeting that we have, about a week after that, we do a town hall where everyone in all five countries that we serve gets on the phone at the same time or the video call at the same time. We share what we share with the board. The materials have gone out and then everybody has an opportunity to review what we shared with the board. Abby and I do a presentation that’s just a short presentation to the group, and then all questions can be asked about how the board received the information or why we shared what we shared or what we mean by X. It’s just a way to have transparency from top to bottom, left to right as, this is what’s we’re sharing with the board.